Lighting- Track? - What type of light fixture is that? Is it on a track? Where can it be purchased? Is this still available? - How about the glass backlight cabinet as well? WOW is spillway made of stainless, what is the thickness, shaped how? 12. Water closet waterfall. 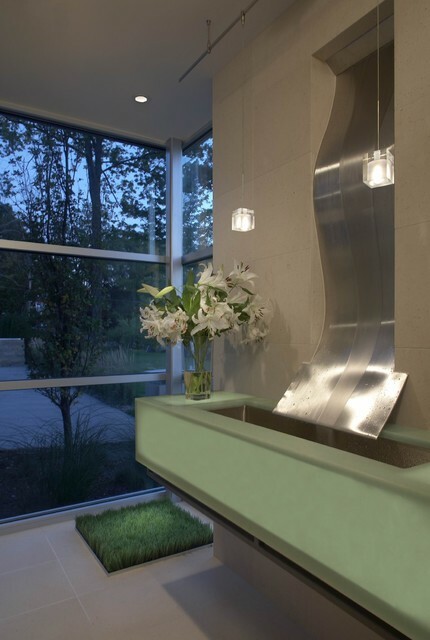 This practical stainless steel water feature gives new meaning to the trend of waterfall fixtures in the bathroom. A substantially bigger commitment than a regular faucet and knobs, it seems to be a risky scaling up of a trend that, like most trends, may ultimately fade out of favor, but by mimicking a natural feature that is found at the same scale in nature, it still retains an appealing element of timelessness.